BANFF, ALBERTA, Canada –No Canadian Rockies vacation is complete without white water rafting in Alberta, one of the country’s top rafting destinations. We provide you with everything you need to experience exceptional rafting in Banff National Park, Jasper National Park and the Kananaskis. Don’t miss this great opportunity to enjoy one of Canada’s hottest outdoor sports! Rafting the Elbow River is a hidden gem of whitewater adventure tours out of Calgary. 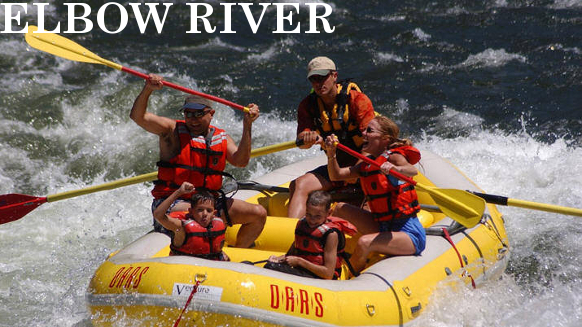 Its short rafting season means that only a limited number of Elbow river tours are run every summer. Enjoy our 2 hour rafting trip on this exciting and beautiful river surfing, splashing and paddling through the rapids in a spectacular setting. So get out into the wild and enjoy white water rafting Calgary style! The river is equally accessible from Banff, Canmore, Calgary and Edmonton, winding its way through the beautiful scenery surrounding Calgary. All equipment is provided, as well as, a complimentary beverage and snack. Book Your Alberta Rafting Tour Today! Whether you’re traveling with your family or planning a corporate outing, an Alberta rafting tour offers a one-of-a-kind experience. Join us this season for some of the best rafting in Jasper, Banff and the Kananaskis!